I don’t consider myself an “artsy” person. The closest I’ve come to being artistic was when I was 11 years old and painted a picture of a flower for my parents. I was very proud of it. They must have been equally proud because they hung the painting in the laundry room, where all fine art pieces are displayed. I like art. I think. I like art for the reasons why other snooty people like art – it makes me sound like I’m smart, cultured, sophisticated, a lover of all the finer things in life and more in touch with the world. I’m a self-actualized human being sitting proud at the top of Maslow’s pyramid where creativity, morality, and lack of prejudice reign supreme. Yup, that’s the most honest and unbiased description of myself I’ve ever heard. I appreciate art for the skill that goes into each piece. The blood, sweat, tears and years of torture involved in an artist’s life. I spend way too much time trying to decide what my iPhone wallpaper is going to be so I can absolutely sympathize with artists on the labour of love aspect. Contemporary art has never really been my thing. I went to an exhibit once at the AGO (Art Gallery of Ontario) but was drawn more to the old masters where in my opinion, antiquity brings credibility. 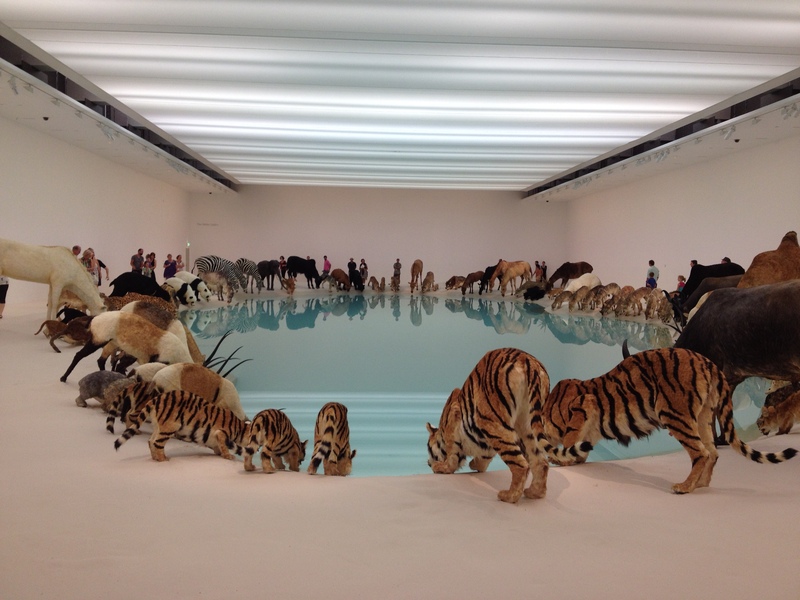 But on my last visit to the Gallery of Modern Art in Brisbane, I walked through Cai Guo Qiang’s (pronounced Tsai Gwo Chang) art piece, called Heritage 2013, which depicts 99 life-sized models of animals from around the world gathered around a drinking pond. Check out the video on Cai Guo-Qiang’s amazing exhibit “Falling Back to Earth” and hear from some of the top art experts about his work. It was something that I’ve never seen before and something that I don’t know if I’ll ever see again. It was surreal to walk around the pond and see the meticulous detail that went in to all 99 animals. This was definitely something that I couldn’t replicate and I admit I was impressed. Cai Guo-Qiang’s exhibition, “Falling Back to Earth” is on display at Brisbane’s Gallery of Modern Art (GOMA) running until May 11 2014. That’s a fascinating exhibit! I’m always in awe of anyone with such talent. Thanks for sharing. I hope it comes to Toronto one day! Thanks Andrea. It would be great if the exhibit made it’s way to Toronto.